A Well-Seasoned Life: My Second Cookbook is Here! My Second Cookbook is Here! Hello everybody! I've been away from my blog for a long, long, long time. I spend most of my time on my Facebook page so you can join me there at www.facebook.com/wellseasonedlife. 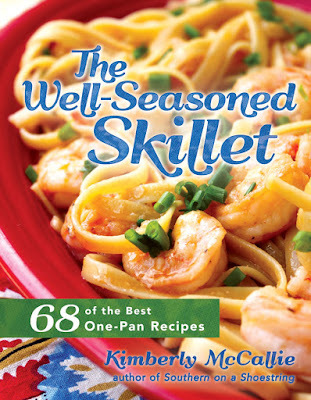 Another project that has kept me busy since last fall has been the completion on my second cookbook, The Well-Seasoned Skillet. The book is available now in various outlets including Amazon and Barnes & Noble. Create gourmet meals in minutes--no expensive kitchen equipment required! With just one piece of cookware you can enjoy mouthwatering appetizers, snacks, side dishes, and entrees. Clean up is so simple, you'll be done in under five minutes. Try recipes like Chicken Pot Pie Dumplings or Buffalo Shrimp Pasta with all of the flavor for a fraction of the effort. This cookbook is perfect for beginners and home cooks. Please check it out! Thanks! !